Celebrity interaction with fans has never been so easy to accomplish. With the prolific adoption of the micro-blogging website Twitter, personalities can speak directly to fans instantly - from anywhere - and see reactions instantly as well. As a Twitter PR exercise, it can be a tremendous asset to anyone in the limelight who has a fan base - and wants to connect with that fan base. Another wonderful example of celebrity interaction is by Dannii Minogue's 'gal pal' Tania Zaetta. The two friends often have Twitter conversations, reminiscing about their days of living together in London, and commenting about what each of them is up to at the time. This interaction proves popular with their Twitter 'followers' because they get even more of an insight into the lives and friendships of their favorite celebrities. Celebrity 'tweets' provide fans with an opportunity to discover more about their personality, sense of humour, and sometimes even the generosity and good heart of their favorite celeb. 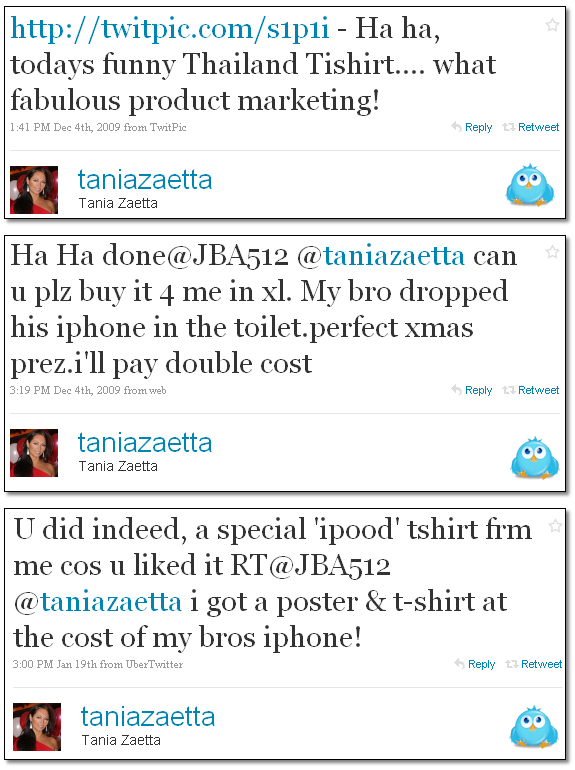 Tania Zaetta, International Aussie Celebrity and Bollywood Star, provides us with a good example. While holidaying in Thailand before Christmas 2009, Tania spotted a guy wearing a funny t-shirt poking fun at Apple iPods. She took a photo of the 'iPood' T-shirt on her Blackberry, and Twittered the pic, along with a funny comment. In return, Tania received a huge response from her followers, all agreeing the t-shirt was hilarious. One follower hinted he'd love the T-shirt as a present for his brother who, unfortunately for him, had just dropped his i-Pod down the toilet! Tania replied instantly, laughing and saying she'd bring one of the kooky T-shirts back for him. The follower, @JBA512, in real life known as Jamie who hails from Perth, Western Australia, responded that he would fix her up for the cost. As promised, Tania purchased the tshirt, brought it back to Australia and mailed it to him just in time to give to his brother for Christmas. As a little extra present she also included a couple of signed posters for Jamie and his brother. "After asking Tania to buy the t-shirt, and of course offering to pay for it, I wasn't expecting a reply as I never had one from a celebrity on any past comments. I checked my Twitter later that day and saw that Tania had replied and agreed to buy the T-shirt. Obviously I was shocked to even get a reply, let alone agreeing to buy me a t-shirt. I double checked with Tania, and she confirmed, so I sent her a DM (direct message) with my address and email, as well as how to organise payment. I was stoked when the t-shirt and personally signed poster arrived, but Tania simply refused any payment. After some research, I discovered that Tania supports the charity Peace For The Children, so I donated $100 to that cause. I'm still amazed a celebrity took the time out of her day to not just reply, but go out of her way like this for someone she doesn't even know."